Lama Zopa Rinpoche blessing a very sick patient of Shakyamuni Health Clinic; Rinpoche did short Medicine Buddha practice for her and all the patients there, Bodhgaya, India, April 2017. Photo by Ven. Holly Ansett. 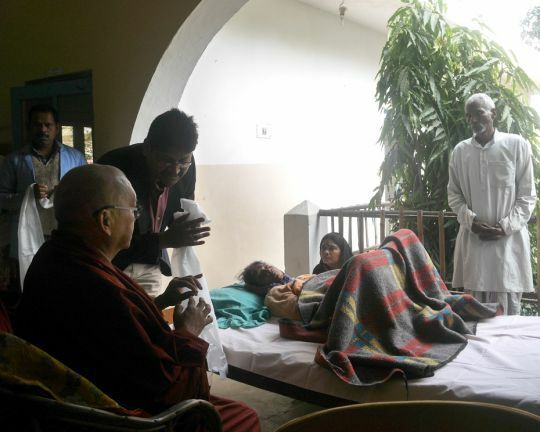 Lama Zopa Rinpoche sent the following advice to a person who fell down and was injured, and is still very sick as well as worried because he hasn’t gotten better. Think that I am the most fortunate one, that I have this sickness, I am the most fortunate one. Why? Because by having this sickness now I can practice pure Dharma. I have been given the opportunity to practice pure Dharma. So I can experience all sentient beings’ pain, disease, spirit harm, negative karma, and obscurations, and they can all achieve the dharmakaya. Also you can meditate that you receive all sentient beings’ pain, disease, negative karma, and obscurations. Think that you have received these in your heart in the form of darkness, like smoke, like black fog, and they destroy the self-cherishing thought, where all the sufferings come from. They are brought into the heart and received there, like throwing an atomic bomb on the enemy, so self-cherishing thoughts are totally smashed. So here you give this to the self-cherishing thought that has caused you beginningless oceans of samsara in the six realms up to the present, as well as the present and endless future oceans of suffering—not only your suffering but has also given suffering to numberless sentient beings from beginningless lives up to now—and as long as you don’t generate bodhichitta, it will bring endless suffering to numberless sentient beings again. So destroy the one enemy, this self-cherishing thought, so it is totally destroyed. And think that all sentient beings receive dharmakaya. You can do tonglen, if you can, taking on others’ suffering and with compassion giving your body, possessions, and merits to other sentient beings, with loving kindness, so they all receive enlightenment, achieve rupakaya. [If you can listen to the teachings that Rinpoche recently gave at the Light of the Path retreat in North Carolina, it is all online. If you can watch that or listen to that, it would be very good]. 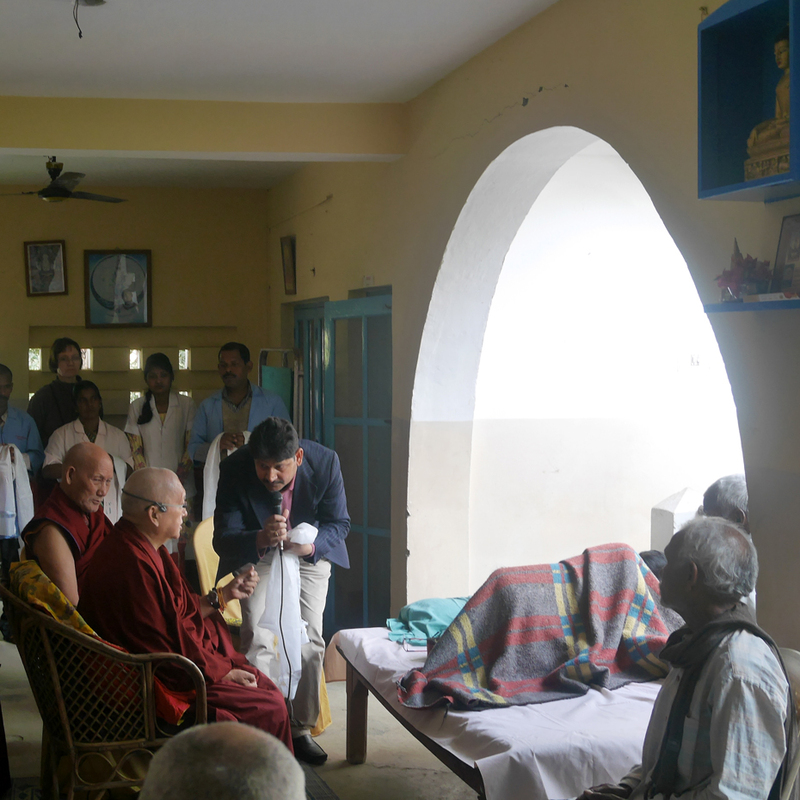 Lama Zopa Rinpoche at Shakyamuni Health Clinic, Bodhgaya, India, April 2017. Photo by Ven. Holly Ansett. So pray like this and recite this each day and do a few malas. This prayer is from the great yogi Choje Götsangpa. So you can see this sickness is helping you. That is why I said how fortunate you are. You can collect more than skies of merit and purify negative karma and defilements collected from beginningless rebirth. This brings you to enlightenment quickly. This is why I said in the beginning how fortunate you are to think in this way. It is very, very, very good, in reality it is like this. This is a gain, not a loss for you, the highest gain, so please do this. Transcribed by Ven. Holly Ansett, Buddha Amitabha Pure Land, Washington, USA, November 2016. Lightly edited by Mandala. Find recordings of Lama Zopa Rinpoche teaching around the world, including at the Light of the Path retreat at https://fpmt.org/RinpocheNow/.